Woah this sounds pretty cool. I own the megaman board game already, but I can't completely figure out how to play it ^^; the rules seem so complicated. Hopfully it's faster than the Board game. for god's sake, why another kickstarter for a board game? didn't they successfully kickstart a board game? why do they need money to make another? Board games are fine: If you have people to play against. If you prefer solitary gaming, then what's the point? Mega Man Pixel Tactics Advance: The Wily Wars, probably the title of the mobile game that we going to get next year. 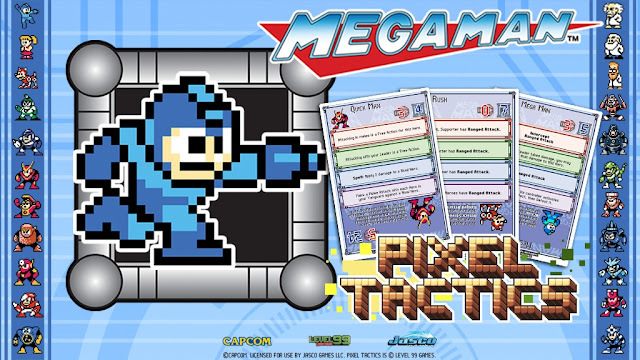 "Mega Man blasts his way into Pixel Tactics! Experience this SRPG style, pocket-sized card game featuring 50+ Classic Characters! ", "Each box comes with over 25 different characters...", "28 characters from Mega Man 1-3 (Blue Edition)", "28 characters from Mega Man 4-6 (Red Edition)"
Why only 50+ characters? Why didn't they feature all the Robot Masters? "Once we're funded, every $10k beyond our base goal unlocks one more promotional card for all backers at the Mega Buster, Stage Select and Super Fighting Robot pledge levels! These bonus cards include characters from Mega Man's latest adventures! If we unlock them all, there may be an even bigger surprise in store..."
Wow! They put Bass, Treble, Enker, Punk, Ballade, and the Robot Masters from 9-10 as stretch goals but they left out Kalinka, Beat, Reggae, Oil Man, Time Man, the Genesis Unit and Quint! This is outrageous maaaaaaaan! I know I left out some characters, so.... your move! So I sent them a message asking if those behind the arbitrary stretch goal pay wall would be available at some point after the Kickstarter is over even if the goals weren't met... and they responded with a delightful non answer. They simply told me that any unlocked stretch goal would be available after the Kickstarter. I guess that was an indirect way of saying no? Shame, was hoping for Bass.